Take Back Vermont | The Vermont Political Observer. Remember Ruth Dwyer? The arch-conservative Republican gubernatorial nominee in 1998 and 2000? (Lost both times to Howard Dean.) The staunch opponent of civil unions and sourpuss leader of “Take Back Vermont”? She’s still around, living in Thetford, and she’s at least as much of a jerk now as she was then. Neighbors’ house in foreground. “Curtain” and Dwyer’s house are way in the background. Photo from the Valley News. *The Valley News is paywalled, but if you register (for free), you can read up to five stories per month. By “huge fence” I mean 60 feet wide and 24 feet high. Basically, a billboard in a rural residential neighborhood. She never sought a building permit. Thetford zoning officials, meanwhile, have determined the structure — forest-green shade cloth strung across five large wooden utility poles along Sawnee Bean Road — is a “wall” and therefore out of compliance until it goes through a permitting process, which is now underway. She claims that the structure is merely a temporary “curtain” that will come down as soon as the 68 young cedar trees she’s planted are tall enough to provide a privacy screen. (Sixty-eight trees? She’s planting a damn forest on her front lawn.) Cedars apparently grow a foot to a foot and a half per year. So with any luck that “temporary curtain” will only be there for a couple decades, more or less. Why the fuss? Also, she claims an absolute right to do what she likes on her property, but she doesn’t want her neighbors to exercise the same rights. Her complaints include the aesthetics of the house. Which, as you can see from the Valley News photo, is functional and plain but not especially ugly. “Mowing the lawn!” Well, I never! What’s next — hanging laundry or putting up a swingset? She also professes to be bothered “by the glow of [the neighbors’] flatscreen TV.” Now, look at that photo again, and try to gauge the distance between the two houses. (Bearing in mind the “curtain” is 60 feet wide.) She’d practically need a telescope to see the glow of a TV set. Finally, she complains of increased traffic on her rural road. As if one stinkin’ house is generating noticeable traffic. The ironic thing, like rain on your wedding day, is that Dwyer is screeching her head off about her property rights being infringed upon by Thetford authorities, while she seems to want absolute control over what happens on neighboring property. 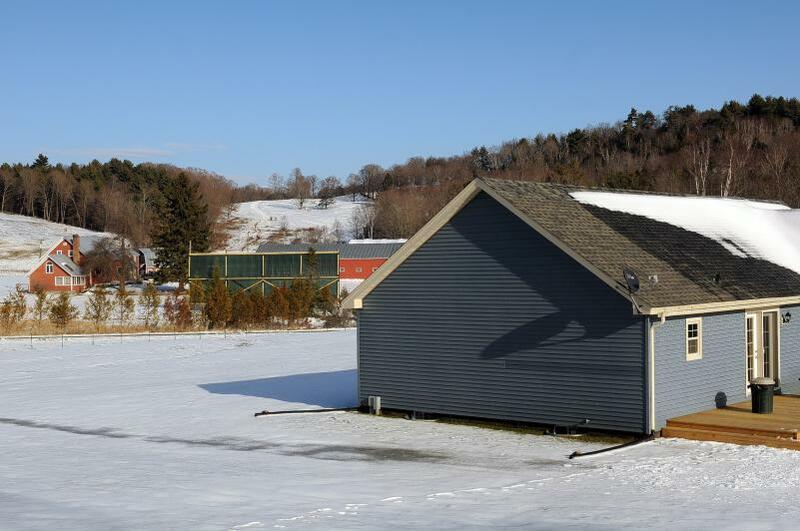 This entry was posted in Land use and tagged Howard Dean, neighborhood disputes, Ruth Dwyer, Take Back Vermont, Thetford, Valley News on December 6, 2014 by John S. Walters.